Surface-mount components on a USB flash drive's circuit board. 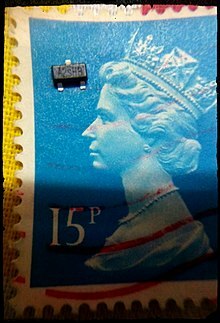 The small rectangular chips with numbers are resistors, while the unmarked small rectangular chips are capacitors. The capacitors and resistors pictured are 0603 (1608 metric) package sizes, along with a very slightly larger 0805 (2012 metric) ferrite bead. Surface-mount technology (SMT) is a method for producing electronic circuits in which the components are mounted or placed directly onto the surface of printed circuit boards (PCBs). 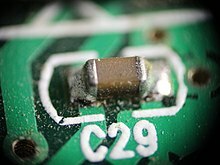 An electronic device so made is called a surface-mount device (SMD). In industry, it has largely replaced the through-hole technology construction method of fitting components with wire leads into holes in the circuit board. Both technologies can be used on the same board, with the through-hole technology used for components not suitable for surface mounting such as large transformers and heat-sinked power semiconductors. 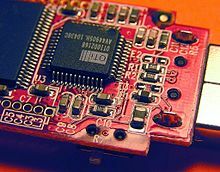 By employing SMT, the production process speeds up, but the risk of defects also increases due to component miniaturization and to the denser packing of boards. In those conditions, detection of failures has become critical for any SMT manufacturing process.